This is a great product and does a good job and even better when use with Black. I use this on Black and Long Beach Red colors. ProsEasy to buff off by hand. It's okay but it's no Pinnacle sovereign. I was using it on my black motorcycle and it didn't seem to shine as good as other waxes that I've used ,very disappointed! This is the third Chemical Guys product that I have bought and haven't been happy with! So far the only product from Chemical Guys that I've been happy with was the vo7 spray detailer , but even that has no depth to the shine, it seems to be just a surface shine. I guess I'm spoiled because I've been using Pinnacle Sovereign for 5 years and every time I try something else and not happy. I used in on a black Maserati that has an exceptional finish. I taped off 1/2 the trunk applying the other half with KLASSE Sealant. Both sides were equally reflective and smooth. I expected a deeper shine or a little extra pop or possibly a little more slickness from the black light side but it was indiscernible. In 3 weeks, after 4 gentle hand washes with a mild PH balanced car shampoo, however, it was very clear that the black light side needed another application. It was not beading nearly as well as the other side. It didn't seem to attract more dirt or look less reflective, but it was clearly not as hydrophobic. I was surprised because this car is garaged and by no means a daily driver, so the sun was not beating down on the finish and I never let it get too dirty. I recently purchased Chemical Guys BLACK Paste Wax and will use it on 1/3 of the hood not the trunk (this time) to again have consistent surfaces. At $75.00 for 8 oz, the BLACK Paste Wax should outperform both products in some aspect. ConsIt's a little difficult to apply but not too cumbersome. It tends to stick slightly as you apply it but dries nicely in about 15 mins. Worked great on my black car, cant wait to add more coats once the snow goes away again. ProsEase of use, and limited amount of product required for good results. Another happy CG follower. Black Light left a a deep, wet looking shine on my 911. It takes some effort to apply but it is very easy to remove and well worth it. Very pleased with the results- Great Stuff. I bought this in hopes of getting a final finish for my car that would be awesome. What I got is something quite a bit less in performance. It acted more like a wax prep than a final gloss product. I am a regular user of Meguiars NXT liquid and in my mind it still delivers a superior gloss for half the price. ConsToo dry of finish. Almost "squeaky" after use. I have used BlackLight on my Black Jeep for over a year. I have always been overwhelmed with how much gloss and clarity it brings to the Brilliant Black (metallic) color. Last week I used it on an '03 Blue Mustang Cobra. When done the blue looked darker and deeper (almost reach into the paint deep). After reading that detailers have applied it almost like a polish with a DA, I decided to apply it that way with my Flex 3401. The first time was with the Blue Cobra and yes, I will be applying it that way from now on. My only issue is that I am a big fan of Collinite #915 because of its length of protection and when I apply it over BlackLight it does not seem to last as long. I have to say, I didn't have terribly high expectations for this, but it came through. The appearance is very good, but I have doubts about durability. CG doesn't really say what this product even is, or what it really does. That's why I'm still skeptical every time I use it... but yet I still use it. It looks good, plain and simple. 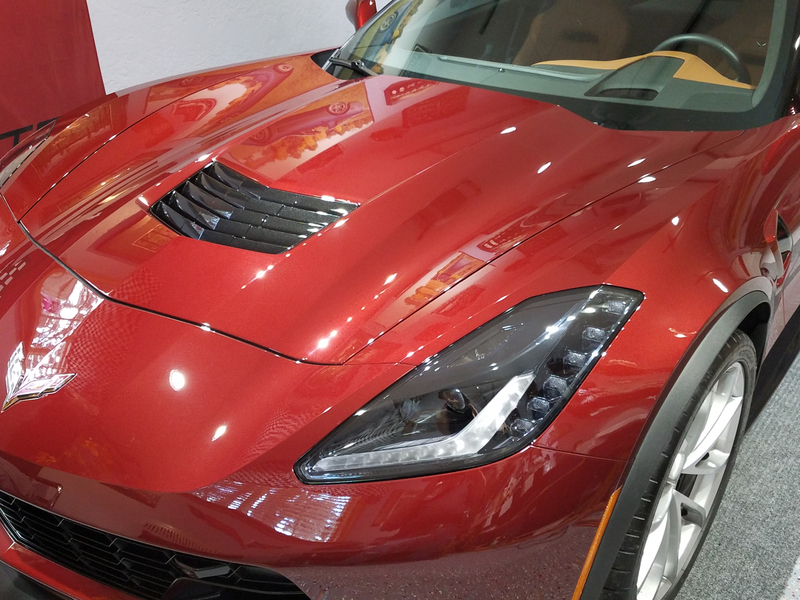 Just don't count on it to really protect your paint like a standard wax or sealant. If anything, this seems like a glaze to me. Use it before your LSP and you'll be happy! BlackLight does a great job at everything. Great shine, gloss and reflection plus it polishes nicely if your finish is in good shape to begin with. Its easy to work with and smells good too. With CG's V7 liquid sealan on top the shine and gloss are first rate and the finish is as slippery as 2 girls mud wrestling. This stuff is amazing! Put this on black gmc z71 and black BMW 528i and took pics......it looked like I was looking in to a mirror. Simply amazing the depth of shine ...... Like black light better than wax. Made a customer for life on this product. Awesome stuff. Applied two layer on a silver car, and although its hard to really make silver "pop", the reflection was second to none! Very easy on and very easy off! Used a blue pad via GG6. Really good stuff. Best AIO! Cleans, light polish and seals. Works great with white or gray pad via DA or rotary.